It’s Friday morning, June 16, just before 6 a.m. This year’s weather forecast promised record high temperatures, many of us wear jackets or half zips and still shiver. The glorious sunrise serves as a fitting backdrop to the countdown. 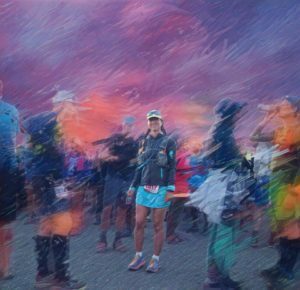 At “Go!,” 300 members of the lunatic fringe club of the running community gallop down a dirt road that soon turns to singletrack. 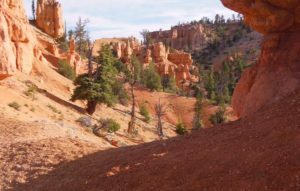 Much of the Bryce 100 follows the Grandview trail. True to its name, the views leave runners in awe. Even speedsters take breaks to enjoy the scenery, and to take pictures. I feel like I’m bursting with energy, so I pass a lot of people. I arrive at Blubber Creek, mile 27, an hour ahead of when I thought I would get there. Could I have gone out too fast? 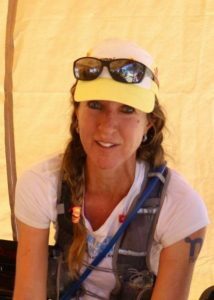 Someone tells me I am third in the women’s field, with 70-plus miles to go. Around mile 30, a blonde woman with an ironman tattoo comes into view. We chat for a few minutes. 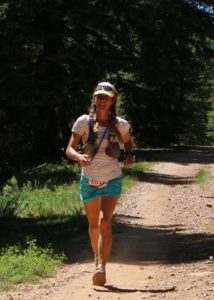 Amy is from Texas, says she is struggling with the altitude, but she looks superfit in spite of that. I surge ahead on an uphill, but expect to see her again. I have found my stride. It’s hot, but I feel strong. The miles click by. No need for music, no need for entertainment other than the cicadas singing in the grass. David, aka my amazing cheerleader/crew/photographer/husband combo model is waiting for me at Straight Canyon, mile 40. 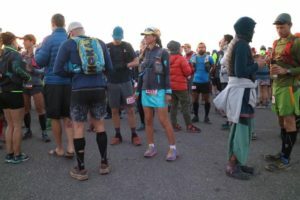 He tells me the first-place woman is only 23 minutes ahead, refills my pack, tells me to eat something and shoos me back out with a kiss and a handful of potato chips. I take off at a brisk trot, in pursuit of the first-place woman. Soon, my back feels wet. While I appreciate the cooling effect, I realize after a few minutes that water is trickling out of my pack. Nooooo! This bladder is tricky, and I did not check to make sure it was closed all the way. 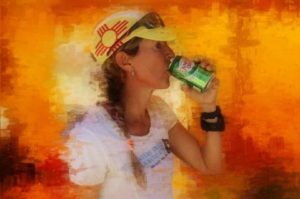 Now, I have only a little bit of water left, not enough to hydrate me until the Pink Cliffs aid station in the heat of the afternoon. I do the smart thing, which is to retrace my steps back to the aid station. While I refill the pack, Ironwoman Amy runs in, looking strong. My lead on her has whittled down to nothing. I don’t even bother to add nuun tabs to my water, but do make sure the bladder is closed all the way before I exit. 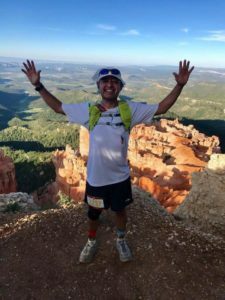 It’s a long climb up to Pink Cliffs, but conversations with fellow runners make the miles fly by: I compliment Chris, from the flatlands of Illinois, on his power hiking technique, which he says he has perfected on a stair master at his local gym. A young guy whose name my ultra brain can’t recall is blasting music from portable speakers. We break into an impromptu and out of tune version of Born to Run that makes everyone within earshot cringe. The view from the top is worth every grueling second it took to get there. I take a deep breath, feeling grateful and very lucky. The last five miles to the turnaround have become more technical than I remember: downed trees, washed-out sections, tricky bits. I try to find a balance between running as fast as possible and avoiding another twisted ankle. David is waiting for me at the aid station. Like a race car pit crew of one, he helps me change my socks and tries to get me to eat something other than watermelon slices. This is the last time I will see him today. He needs to go back to our hotel and prepare for his 50, which starts the next morning. We hug, then I am back on my feet and back on the course in record time. The sun is starting to lose some of its brute force. I know I am way too far behind the first-place woman to catch her, but I want to fight for second. Amy is close behind me, approaching the turnaround as I head out. 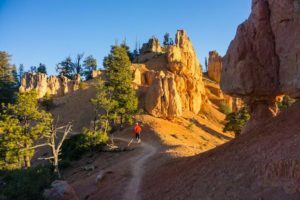 I run strong all the way back to Straight Canyon, soaking up the views of the hoodoos in the setting sun and feeling intensely alive. Mile 62. I am sitting in a chair at the aid station, gulping down a can of ginger ale. It’s 8:30 pm, time to get ready for the night ahead. Should I change into long pants? 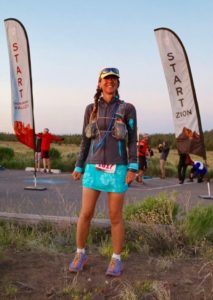 I remember the chilly morning, and the near-freezing conditions from my last Bryce 100, so I wiggle into my tights and pull on a half zip. It’s still a little too warm, but I expect temperatures will drop soon. I’m wrong. By the time I turn on my light, it’s cooling down, but not very much. 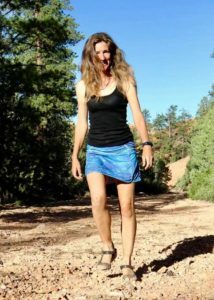 My running skirt is miles behind me now, crumpled inside my drop bag at Straight Canyon. I have more warm layers waiting for me at Blubber creek, but no shorts, or short sleeve tops, which I now regret. Unless I want to run naked, which is probably against Utah state laws, I will be stuck in my tights until the finish line. Darkness falls like a velvet blanket. I keep running at a decent pace, but on a lonely stretch of trail around mile 70, I do what I do in every 100 once or twice: I turn off my lights, look up at the sky, and listen to the night sounds. I feel itchy and sweaty, but much more than that, I feel lucky – lucky to be out here, lucky to experience this moment of solitude and wonder, alone with the universe, one with the trees and the stars. Even the pain, coming alive in my quads and hamstrings now, is cause for celebration. I am here. The time is now. I breathe in joy. I breathe out gratitude. It’s the simple magic of life. Steps behind me break the mood of contemplation. It’s Alex, originally from France, now living in Colorado. We’ve spent some miles together earlier, before he hit a low point at the last aid station, but now he pulls ahead while I stay behind. A couple of other runners pass me over the next few miles. It’s finally cool enough for tights and long sleeves, but now my quads are telling me to slow down. By mile 80, they are yelling. This race reserves some of its most brutal climbs for the last 20 miles. I knew that this morning, when I hammered down these hills, but the morning was too beautiful to take it easy. Now, in the darkest hour before dawn, my legs are screaming bloody murder. I can feel blisters forming on my feet. My new head lamp, powerful but heavier than my old one, has dug a dent into my skull. I walk all uphills by now, and jog the downhills. On one of those I stub my toe, which joins the growing number of protesting body parts. My toes, feet, thighs, and forehead are waving banners saying:”Enough abuse!” or “Are we there yet?” Only my stomach is cooperating for once, happily digesting another Stinger Waffle, but everything else threatens to go on strike. Even the picture of Ironwoman Amy running past me to a second place finish fails to motivate me. The nine miles to Thunder mountain aid station take forever, but there’s light on the horizon, and only eight miles or so left to go. My time goal of 25 hours has slipped away during my time in the pain cave, and even 26 hours now seems unlikely. It’s ok. I know I will finish, and resolve to a) get done before the day gets hot and b) enjoy the remaining miles, no matter what. 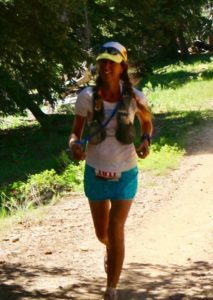 I exit the last aid station, hobbling on my blisters. About 30 minutes later, I get to a crossroads. The pink 100-mile flags lead up a steep mountain on my right, but so do yellow flags I don’t remember seeing before. I follow the pink, then have second thoughts about halfway up. This is an out and back course, and I don’t remember seeing a sign saying Red Canyon this morning. 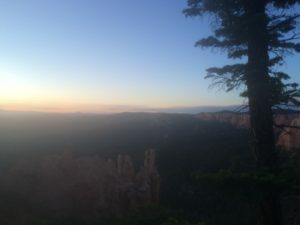 I climb back down, to find two guys I remember from the aid station scratching their heads at the intersection, asking themselves the same questions. We explore the other direction, which lacks flags altogether and also looks unfamiliar. A fourth runner joins us, and we go back up the mountain together, though none of us remembers this stretch from the morning. None of us has a pacer, i.e. someone who is still thinking straight. Between the four of us, we don’t have enough brain cells left to make any sort of rational decision. We decide to stay together until we find the finish. Jeffrey, Jonathan, Josh, and Katrin, four sleep-deprived, utterly exhausted souls staggering through a beautiful desert morning. From the top, the view is beautiful but still unfamiliar. The pink flags look reassuring. The yellow ones do not. I remember my phone, on airplane mode in my pack, and notice we have cell reception. My mushy brain spits out one more bright idea: call the race founder! Matt Gunn answers, sounding surprised when I ask him if he has changed the course. No, not really. Yes, it sounds like we’re on the right trail. Yes, we’ve been through here this morning, and the yellow flags are for the half marathoners, which share part of the course with the 100-mile lunatics. I thank Matt, wondering if he will still respect me after this conversation. At least our little group is reassured. The sunrise is gorgeous, but I’m still wearing my long-sleeve top and tights, which makes me dread the rising temperatures. We are in similar stages of physical distress and agree to power hike the rest of the way together. How many more miles? There can’t be many. We stagger along a series of serpentines, up and down. My sunglasses are in the Straight Canyon drop bag, at mile 62, and the bright morning sun is playing tricks with my eyes. I see Gandalf the wizard in his pointy hat . . . no, it’s a tree. I am not the only one seeing unlikely creatures: Jeff describes a Panda bear, Jonathan a playground, complete with playing children. A clearing with horse corrals and an old outhouse finally jogs my memory. We are on the right trail! We are going home! One more uphill. No, another one. And another. Two kids ride mountain bikes. We make sure they are real people, then ask them whether they have seen a finish line. Yes, they have, just a little ways ahead. We scrape up our last reserves of energy. My toes hurt so much that all other pain pales in comparison, but we’re almost there. A campsite. The finish line? No, another half mile or so along a dirt road . . . Finally, there it is! All four of us cross in 26:45, hours slower than I had planned, but somehow still good enough for second place female. Our four-runner fellowship disbands, with hugs and congratulations. Then, I remember the pain I’m in. There is blood seeping from my shoes, making me feel like Cinderella’s evil stepsister. The amazing and not the least bit squeamish Toby Langmann-Gunn doctors my blisters, but my day is not over: After a shower and a nap, I drive to the Proctor Canyon aid station to pick up David, who ended up severely dehydrated and made the wise decision to drop at mile 33. I don’t like to overuse the word “epic,” but it applies to this weekend in its truest sense. 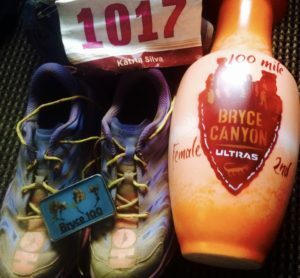 Bryce is a brutal race, especially in record heat. Bryce is also one of my favorite 100s. It’s challenging. It’s gorgeous. It’s unforgettable. This was my 11th 100, and I am still learning how to run these beasts. I already know I will be back for another shot at a sub-25 hour finish next year. Thank you, Matt Gunn, Toby, Tana, and everyone else at Ultra Adventures. Thank you, Jeff, Josh, Jonathan, Alex, Chris, and everyone else I shared some miles with. Thank you, most of all, David Silva, for yet another romantic getaway weekend. Life is good! Recovery hike before driving home to New Mexico on Sunday. This entry was posted in Uncategorized on June 26, 2017 by silvakat.